Size Approx. Weight / Age Before Washing Measurements, inches. Chlorine-free Oeko-Tex 100 certified Cloth-eez prefolds. Cheaper by the dozen. The price of 11 individual diapers is the same as 1 dozen, which is like getting 1 free diaper when you buy in dozens. Additional 5% savings will appear in your cart when you order 3-5 dozen. Save an additional 8% when you buy 6 dozen. Yes, you can mix sizes, white, unbleached or organic in dozens and still get the quantity discount! Prices vary by size, available in dozens or individually. Please visit the Detailed Information link to learn more. Also in preemie purple edge, not pictured. Please refer to the pictures on babies and the Size Chart prior to purchasing. As with all clothing, size recommendations are suggestions and not guaranteed. If unsure of size please wash only one or two; unwashed items are returnable in accordance with our return policy. Cloth-eez® Prefolds actually fit. A diaper that fits works best. One-size-fits-all really doesn't "fit all". Does a diaper that fits a 2 year old really fit your newborn? Nope. The right size for the right age and weight works best! Diapers that fit are diapers you will use. These are the "top of the pile" diapers that you will reach for first. Well-loved. In the sizes that fit your baby. Measurements listed are approximate and shrinkage will vary which is normal for this kind of fabric. Edge color/tone will vary. Be sure to look at the pictures on babies. The "white" version on this page is a creamy white because we do not use optical brighteners on the cotton. They are not chlorine bleached, either. They are certified according to STANDARD 100 by OEKO TEX® and meet CPSIA standards or course, too (every baby product on our site meets CPSIA standards). Because our white is less processed than your typical bright white cotton, they feel softer. 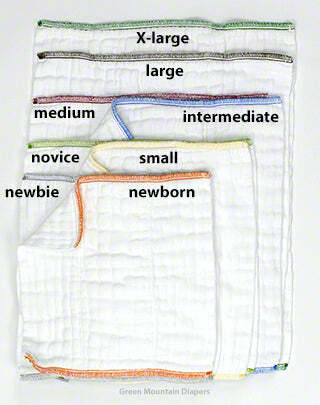 Color-coded edge stitching makes it easy to find the right size diaper in your pile. These beautiful classic diapers are so nice! Affectionately known as "GMD Prefolds" are the gold standard for prefold diapers for over a dozen years! Award winning, top quality, heavyweight 100 % cotton twill diapers are so very well made. They will stand up to repeated washings. Don’t overlook this very economical way to diaper! It works very well. Plus, they wash and dry very easily and never get that "icky polyester stink". It’s very easy to Snappi fasten or pin these diapers on babies who don’t yet roll over. But you don't have to pin them. You can just fold the diaper in thirds and place it in a wrap style cover. You will not be disappointed in these wonderful, versatile diapers. These are the very best fabric, 100% Indian cotton, 4-8-4 ply, with the strongest edge stitching available, and custom sized for prefold perfection. These are exclusive to GMD and are not available anywhere else, and are not marketed under any other brand name but Cloth-eez®. Diapering with prefolds that fit really is easy. 100% cotton exclusive of trim. Made in Pakistan. Learn how to use prefolds. Step-by-step pictures, detailed information and see many pictures of these on babies. One FREE pair of pins per order is available with purchase of this item when you add the pins to your cart through this Link. Please wash a few times before first use. Link to more washing information. Please note that you can use any mainstream laundry detergent on cotton diapers. You do not need to purchase "special for cloth diapers" detergents. We do not sell them and they are not needed on prefolds or Workhorse diapers. Keep it simple. Use what you would normally use on your regular household laundry. Yes, Tide is ok or whatever you happen to like but we do suggested unscented choices. Please be sure to see this on a baby to learn more and pick your correct size. Sizes overlap and are approximate. 100% cotton, exclusive of trim. Edge thread and tag are nylon or polyester. I just ordered another dozen of the size Medium unbleached prefolds because both my daughters have worn that size primarily for over a year and my older ones were starting to show the wear. With kid #3 on the way, I figure another dozen will be well-used. Neither of my girls ever made it to the large size before they were potty trained (they are on the smaller side and we just fold the diapers into the covers). The older ones can still be used for sure; they are just starting to fray at the edges a bit, but remain highly absorbent. Washed these three times before using. Folding them the short way now and these last forever - even overnight. Bulky, but to be expected from a prefold. These prefolds are so soft. We haven't used them yet (I got the newborn size and we didn't use cloth right away for our first son), but the quality is exceptional. I love all GMD prefolds, but the organic ones feel even more incredible than our bleached ones we use for our two year old. Our new little guy will be here in a few weeks and I think these will be perfect on him. I am looking for diapers that have the softness of those that I bought for my son 35 years ago. These are the closest I have found. We use them as burp cloths for my grandchildren. The intermediate size which we ordered is probably a bit smaller than we would like. What you’d expect. Hold up great to washing and drying. Very absorbent.